I have literally slept only three hours last night since the night’s festivities continued until 7 am. I had a really fun time dancing to indie tunes and hanging out with my friends. The outfit and make-up inspiration came to me while browsing through the Elle runway collections of fall/winter 08/09. My eyes focused once again to Givenchy’s oh so black RTW collection. I honestly think I will forever be inspired by Riccardo Tisci’s creations, the man is truly a genious. The blazer and white button-up are purchases from Sweden and when I got them I did actually have Givenchy in mind. I was gonna wear the platform sandals to the club but the snowstorm outside told me otherwise. Winter has finally arrived to Finland. the bow is to die for. Oooh-la-la, so wonderful. The sandals and the bow really make it. I thnk you are the best when it comes to taking inspiration from the catwalk and turning it to your own style. 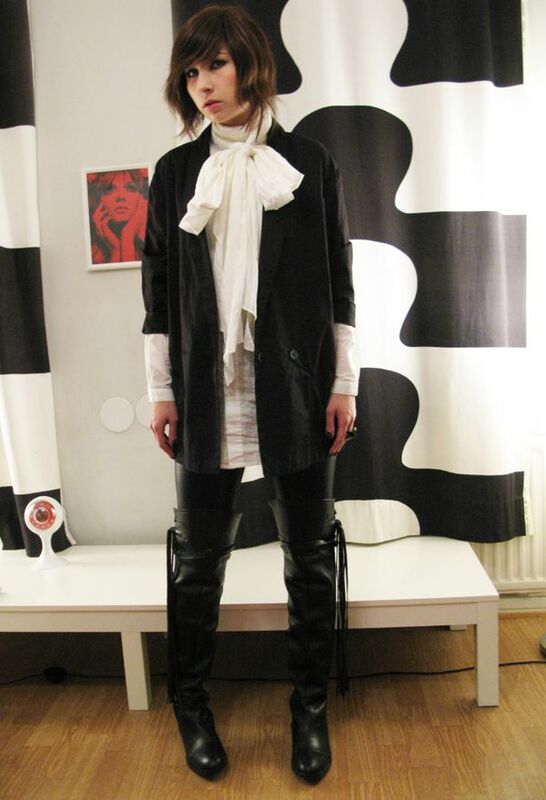 Great outfit!=) The sandals are stunning but I prefer the boots. I really love your inspiration for this outfit. Black is such a versatile and amazing color, it can be worked to fit any mood. Anna Maria, you’re my queen. It’s amazing!!! I really like your take on the look. Greatly done =) Great blig as well! Join the Gossip: Thanks! I love love love Givenchy. 🙂 Welcome to my blog!